Programmatic: Empty Buzzword or Marketing Revolution? Home » Advertising + Marketing » Programmatic: Empty Buzzword or Marketing Revolution? The answer, as usual, is somewhere in between. Like most jargon of the marketing and advertising world, the word “programmatic” has been talked about longer than it has been practiced. It started out as an idea and it has evolved into both an industry and a core competency for a growing number of brands. Crystal clear, right? I didn’t think so. Think about how people shop for products on Ebay. A person goes to the site, searches for the product they want, wins an auction for the product, and then tracks the delivery status of the product until it arrives at the persons door. “Programmatic” has taken the Ebay analogy to another level. Imagine if you had access to a software platform that could be configured to understand what you want to buy on Ebay and how much you want to spend. Then, this platform would constantly run – buying items on your behalf – without you ever having to interact with Ebay or the software platform. Furthermore, imagine if this software platform consistently modified its buying preferences based on an almost limitless amount of data about you and your activities – both online and offline. By leveraging the concepts and technology labeled “programmatic”, your brand can advertise products to narrowly targeted consumers requiring little to no human intervention. Algorithms that filter impressions based on behavioral data allow online advertisers to spend more time being creative and less time reading spreadsheets. I think it’s safe to say that everyone wants to spend less time reading spreadsheets. The short answer is that “programmatic” makes the management of your advertising inventory more efficient. This increased efficiency is achieved by letting software do what it does best while freeing up your people to do what humans do best. The longer answer is that because the tools, technologies, and processes around “programmatic” have matured in recent years, the usage has increased. The brands that have smartly and steadily grown their usage of “programmatic” are enjoying the increased efficiency described above. Where does the adoption of “programmatic” stand? 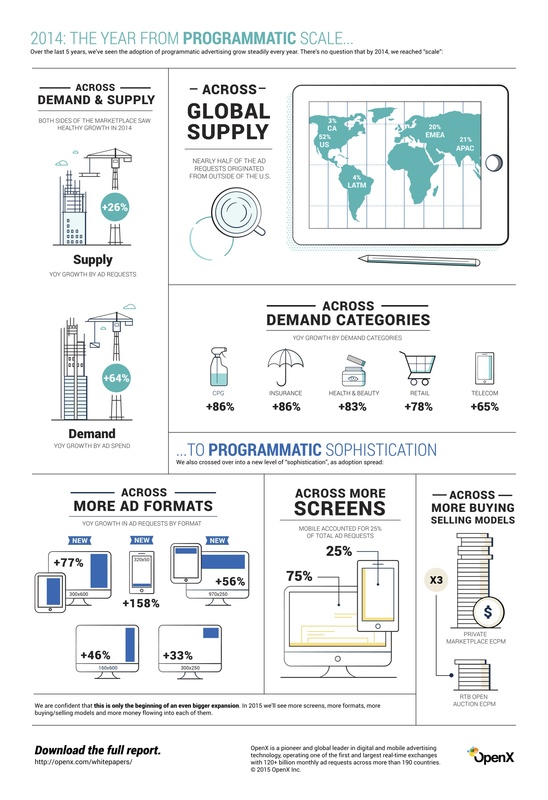 The following infographic from OpenX gives a good picture of the state of “programmatic” as of the end of 2014. There is clearly demand across many industries for programmatic advertising, and that demand is growing. What’s the next step for your brand? If you are not using “programmatic” at all, then you need to figure out how you want to start. If you are using “programmatic” but you’re not seeing the return you want or hoped for you when you started, then you need to figure out how to get to where you want to be. I think it is safe to assume that you’re brand is never going to go “100% programmatic”. There will always be situations where people need to be involved to make the right decision and close the deal. However, the further your brand is from maximizing its “programmatic” efficiency, the more time your people are spending reading spreadsheets and the less time they are spending being creative. Agency Spotter can help you find a partner that can formulate or refine your “programmatic” strategy and help you find the technology you need to get the results you desire. Jason holds a B.S. in Computer Science from Auburn University and has worked in consulting, goverment contracting, and traditional IT. He is currently a Solution Architect working in the pharmaceuticals industry. When not managing client expectations, Jason spends time with his beautiful wife, five sons, and two dogs.